What makes a muscle car a muscle car is something that will get plenty of arguments. According to some purists none of the current crop would make the cut. The fact that all modern muscle cars have independent rear suspension is one deal breaker for them. For us we count mainly four cars as modern muscle cars. The Ford Mustang, Chevy Camaro, Dodge Challenger and Dodge Charger. These all offer variants with more horsepower than brains and yet these modern cars are able to take a turn much better than their classic models. Between these we will choose our Muscle Car of the Year. This year is quickly coming to an end and it is now time for our annual Sports Car Guy’s Awards. This is the fourth year that we have selected the best cars in various categories all leading up to the Performance Car of the Year. Over the next few weeks we’ll be naming the winners of the following categories. You’ll also see all of the nominees in each category. Last year the Porsche 911 GT3 took the top honor, but will the track focused GT3 RS be able to follow that act or will another performance machine be named Performance car of the year? This week is a big one for automotive enthusiasts. Most of the press will be following Monterey Car Week, but for those that can’t make it all the way to the California coast there is another big event. If Birmingham, Michigan is closer to you and if American Muscle / Hot Rods are more your style then the Woodward Dream Cruise is a must. The big three will show off their latest cars and of corse there will be a lot of classic metal. The 2015 Dodge Challenger and Charger SRT Hellcats were in very high demand. In fact so many enthusiasts wanted the 707 horsepower American Muscle cars that many dealerships got their hands slapped for selling cars that they would not be getting. Fiat Chrysler Automobiles (FCA) has decided to up production for the rare cat, making it more likely that you’ll see one on the road. Having experienced the high performance machine myself on the road and track, I can attest that you will hear it coming (and all but the most powerful cars will hide in terror). How’s this for a battle between two icons of our time? In one corner sits the car of the future. Decked out in sleek black, it’s the Tesla Model S P85D. Riding 691 ponies to reach 0-60 mph in 3.2 seconds, the P85D’s electric engines – that’s right, it has a motor for each set of wheels – is the kind of thing science fiction writers would put under the hood of a flying car. In the other corner sits the throwback. 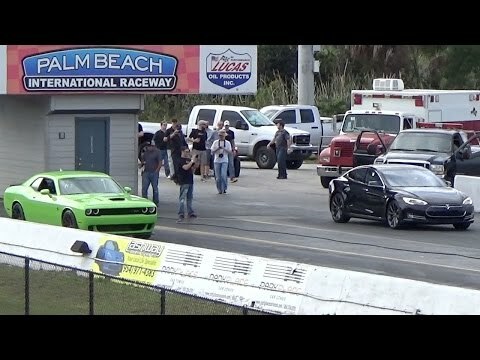 In lime green, it’s the Dodge Challenger SRT Hellcat. Sure, gas-guzzling muscle cars might have had their heyday decades ago, but the Hellcat is living proof there is definitely still a place for them in this increasingly environmentally concerned world. True, the only thing green about this car might be the paint on its exterior, but some people are willing to overlook that for the insane 707 horsepower it has under the hood.